October « 2015 « Geekorner-Geekulture. Shirobako ended in the only way it could, and in the way its narrative arc had outlined from the beginning. Shirobako ended on an optimistic note, and I felt betrayed by it. 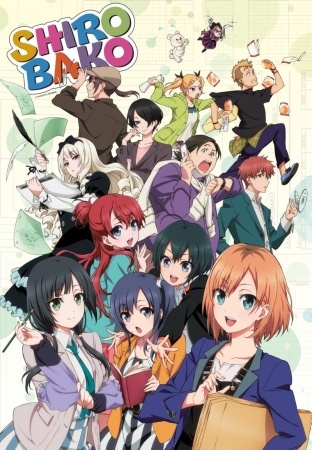 Since like many of the best pieces of media out there, Shirobako is about life, and since this post, as is the case with most of what people write, will hinge upon my personal experiencing of it, mediated through my own experiences, I will now get to do what bloggers the world over love doing: Write a bit about myself. Also, that sure was a long sentence. I’m not an old person, but I definitely fall under the heading of “adult”, and am older than what the average anime-watcher in online communities is. I’ve served three years in the military, and between my B.A. and M.A. had the opportunity (and need) to work for several years, full-time. I’m no stranger to insufferable co-workers, implicit threats of physical violence, burdens heaped upon the capable until they buckle, unlistening leaders, and more. More-over, and this is the salient part, I came into workplaces expecting these things, so perhaps I gave them a larger place in my mental landscape than they objectively took up, but perhaps even that is a comfortable lie. I’m a cynical optimist, and this is relevant to my reaction to the show, and to much of anime’s storytelling in this regard. All the premieres are behind us, and I’m sort of fine with this season. Nothing is really exciting me yet, and most of the crap had been left behind. I’m still unsure about a bunch of the shows, but it’s not like there’s much else this season to pick up. Slim pickings, but I’m fine with what I’ve got. As always, the list is ordered by how much I liked the episodes, combined with how good I thought they were, in a descending order (first is best, last is worst). Numbers in parentheses are change from last week. This was a pretty cool episode. It had Ushio being cool and saving everyone, and literally saying a man should come to the aid of crying women when he can, several times, which was a bit cloying, but there you have it with a middle-schooler (he’s literally chuuni) who was raised without his mother and told he should always act for the sake of the dead mother who’s watching over him. 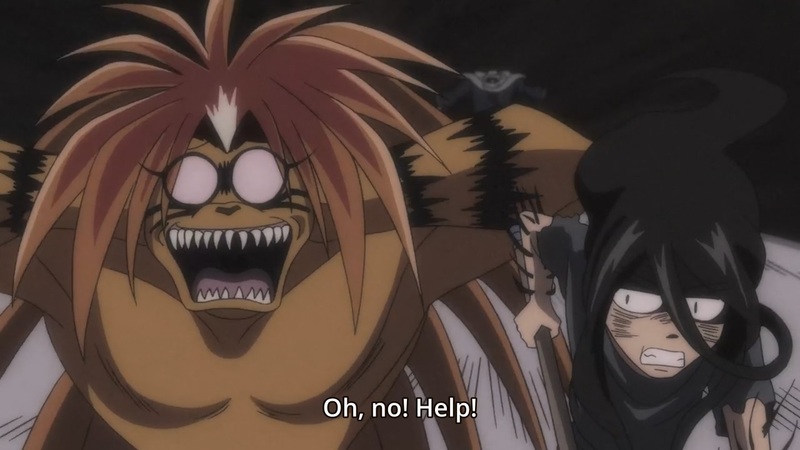 Anyway, we had cool action sequences, and self-sacrifices, and it was all gloriously shounonsense in the way I like best, with even the fanservice just sort of being there rather than being made a deal of, and Ushio and Tora being their usually cool self, and all the random monsters saying how great Ushio is. I have a shtick, my shtick is to talk about what episodes mean, what they want to be about. Sometimes, some shows make it easy, by very much wanting to ask you what they are about. Sometimes, those very same shows also make it hard, by making it pretty hard to understand what they’re trying to say, or trying to obfuscate it. 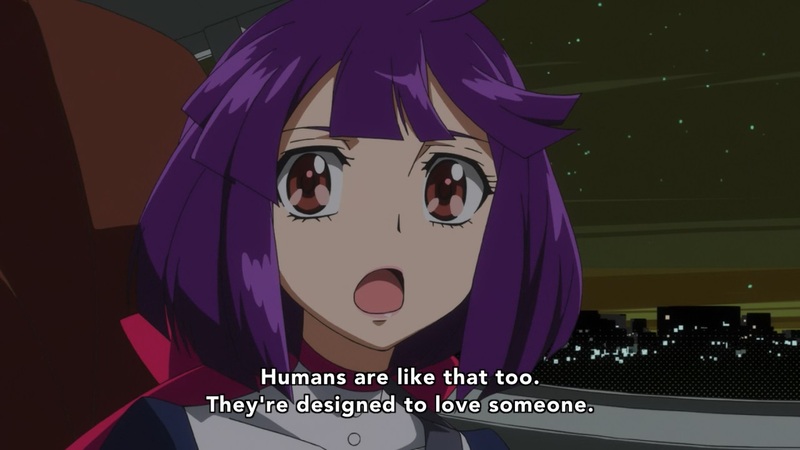 Thankfully, this episode of Concrete Revolutio, while very much being about a very specific thing, is actually pretty easy to decipher the main theme, the main question it wishes to ask. But it doesn’t tell us the answer. Then again, I’m getting ahead of myself. So what is this episode about? Oh you know, the usual Big Questions™, such as “What is justice?” “What is love?” and the one question both of which are eternal variations thereof, “What is free will? What is choice?” Nothing major. The episode’s plot and the specific choice of superhuman chosen was also in line with this question, as androids and being “programmed” often go hand-in-hand with questions of free will, and God. Just as last episode’s theme was change, and it was explored using a shape-shifter that’s locked into one form, one age. 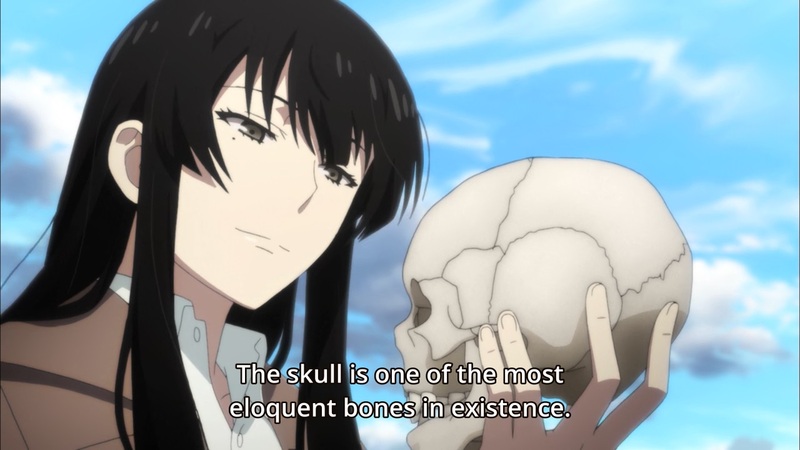 Three first impressions (Beautiful Bones – Sakurako-san, Perfect Insider, and Garo Season 2), and episode 2 of everything else. Considering last week I spoke of how multiple shows didn’t really tell us what they’re like in their premieres, let’s see how they did with their second episodes. As always, the list is ordered by how much I liked the episodes, combined with how good I thought they were, in a descending order (first is best, last is worst). Numbers in parentheses are change from last week. I’m also going to give each premiere a couple of scores, “Premiere Score” for how well it did its job as a premiere, and “Episode Score”, for how well it worked as a regular episode. In case you missed it – THE MESSAGE is hammered at you. 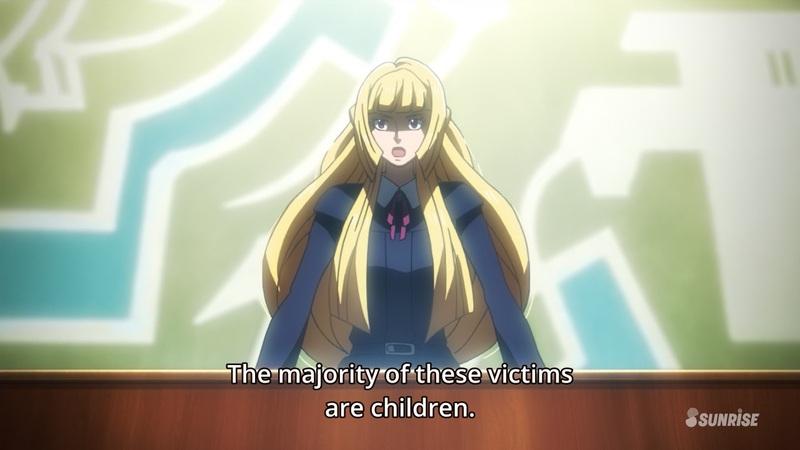 Following a good premiere, Orphans delivered another good episode that did some serious job in fleshing out its characters, and was actually relatively subtle about its characterization of them, showing us how Mikazuki and the rest of the Space Rats lack either past or future, using their illiteracy both as a metaphor for their situation and as a possible cause of it. They do what they do not for anyone else, not to save Kudelia, but for one another, and because they have nothing else. They’re much lower on Maslow’s Hierarchy of Needs, but their self-respect still plays a part, as this is Gundam, and “villainy versus chivalry”, or “means well” versus “Doesn’t even try” is a very real theme. Adapting a proper novel series. Not light novels, with series composition being done by the person who did series composition for both seasons of Gatchaman Crowds, and a proper mystery tale to boot? This is one of the three shows I was most hopeful about before the season started, so let’s see if it delivers. Almost none of this materialized in the first episode, which felt more like a prequel to the above narrative. It’s been the case with multiple shows this season, but damn, a premiere is supposed to provide some sort of hook, to grab you into watching the show, and to tell you what sort of story it’s going to tell. It really didn’t seem as if Perfect Insider was terribly interested in that. This is one of the shows I have higher hopes (if not expectations) for, seeing as it’s based on light novels that are closer to actual novels, and the premise, art, and everything surrounding it remind me of Hyouka, which is a masterful show when it comes to dealing with the small moments of human interactions. The preview made this show look very pretty. The director and vice director are inexperienced, so I’m going into it mostly blind. But seeing as it’s a mystery, you’ll all be pleased to know that the series composer worked on Mawaru Penguindrum and Yuri Kuma Arashi, so should be up to the task of handling potential complexity. I thought before this show even began airing that it reminded me of Hyouka, and it might have caused me to find more similarities as I kept watching the show, but boy do I feel this show is trying to be Hyouka in various small ways. It’s really not a bad thing, just as Psycho-Pass trying to be Ghost in the Shell: Stand Alone Complex and paying constant homages to it wasn’t a bad thing, seeing as both Hyouka and Stand Alone Complex are two of the better anime shows ever made. 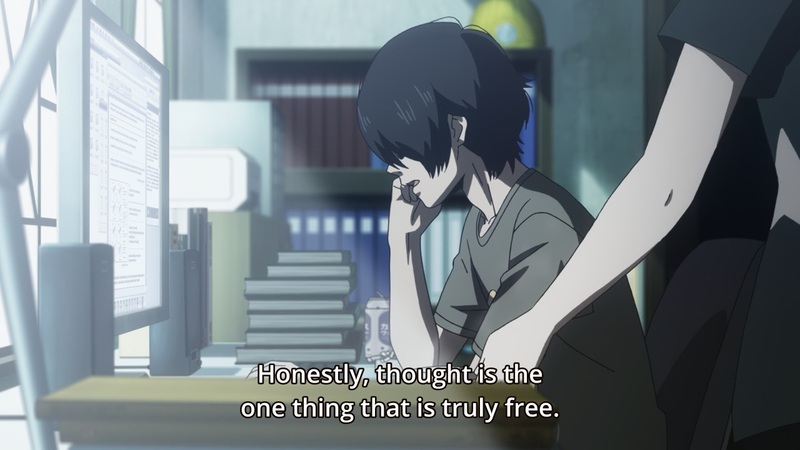 But it’s there, and more than that, all those psuedo-poetry like lines, all those “so cool” line about how this world stopped moving, or the nature of death feel as if they try to appeal to a certain crowd, of which the protagonist Aku no Hana would definitely be a member. Well, the new season is here, and I’ve watched a bunch of premieres. 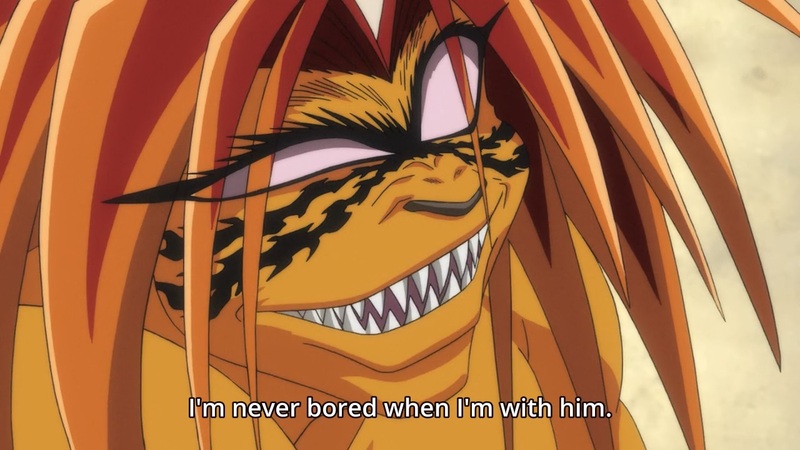 It’s time to tell you what I thought of each of them, as well as the lone Summer holdover, Ushio and Tora. As I actually wrote something longer for each of these shows (aside from the shorts), I’ll keep it brief, and link to the lengthier impressions post. As always, the list is ordered by how much I liked the episodes, combined with how good I thought they were, in a descending order (first is best, last is worst). I’m also going to give each premiere a couple of scores, “Premiere Score” for how well it did its job as a premiere, and “Episode Score”, for how well it worked as a regular episode. It might be because I already know what to expect from this show, and that it’s meeting my expectations, but I think a large part of it is that from the very beginning, this show knew what it wants to be, and was never shy about it. Regardless of the reason, this is the episode that I enjoyed the most this past week, and fittingly enough, it’s the only carry-over from the Summer season.